Welcome back to Hockey season! 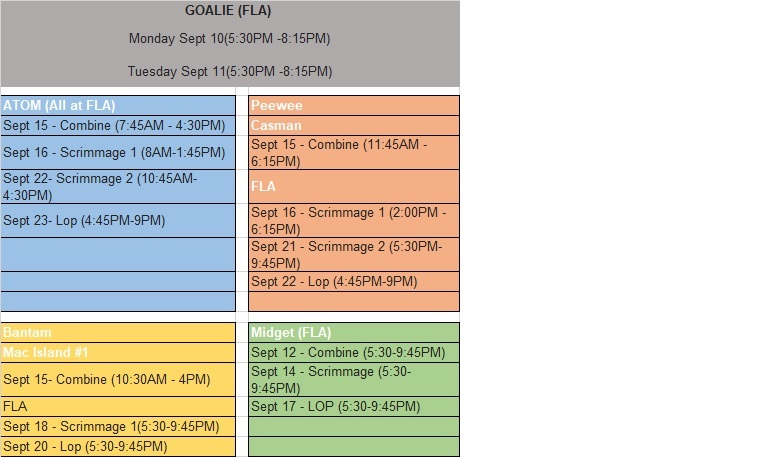 FMMHA is excited to kick off earlier this year with our season for the WBHL for Atom - Midget. Sept 3 - Sept 10 We will Have Pre Season Development Ice with our Professional Partners - Athletic Edge (AE), Total Athlete Development((TAD) and Power Edge Pro (PEP). There is enough sessions for every Player to take advantage of 2 Sessions, These sessions have no bearing on evaluations. NOTE: If You Sign your player up for more then 2 sessions Directors will Delete all Your sign ups with out warning, and you will need to resign up in any left over spots. Please be courteous and allow all our players opportunity. We will have a sign in table and only players registered in each session will be allowed on the Ice. 24 Hours before a session a Player make take 1 additional spot.